There’s been a lot of talk about the Evora lately, with rumours of facelifts, limited edition, race inspired, models, and a raft of detail upgrades and improvements for the MY12 cars . I’ve got to admit it’s a car I’ve been taking a keen interest in as well, starting to build up information on for the TechWiki and keeping an eye on the second hand market as potential replacement for the Elise at some point in the future, but I hadn’t driven one. 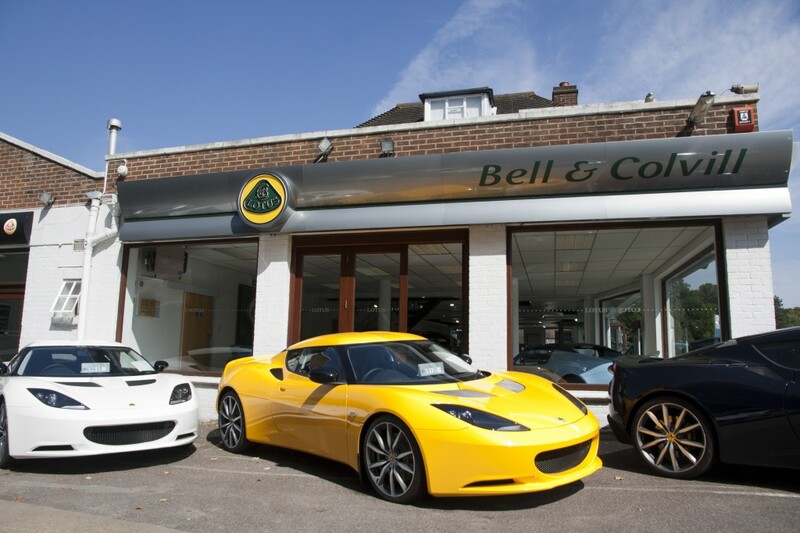 So when Jamie at Bell & Colvill sent news that they were hosting an Evora S open day I couldn’t resist the temptation to drop them an email to see if I could come along to have a drive, purely for research purposes of course…. So Friday finally comes, I make my way down to West Horsley (via the worst surface road in the country—must check my damper settings) and as I turn in to the car park I know my trip is going to be worthwhile—a grand total of seven Evoras are lined up outside the showroom, it’s an arresting sight. Jamie’s busy inside with a potential customer, so I take the time to gather a few detail shots of various options and extras on the cars for the TechWiki pages before heading in to take a look around the Elise Club Racer (disappointingly specced with the ‘Comfort Pack’) and grab a coffee. While inside I get chatting to another customer who’d just retired from Historic Racing and is considering selling his original Lotus Elite with just 29,000 miles on the clock—be quick though if you’re interested, as he’s already had an offer of £70,000! Just as I finish my coffee I’m introduced to Martin Donnelly—former Lotus F1 driver—who’ll be joining me on the test drive. 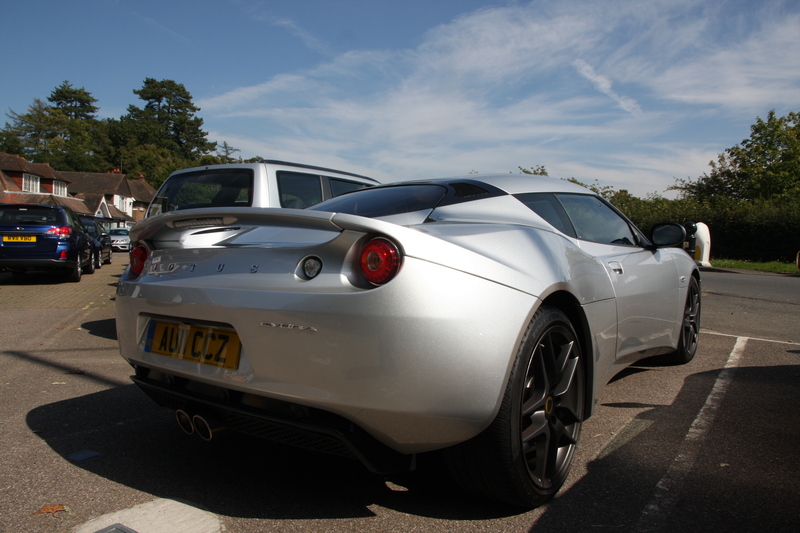 Our car for the drive is an Arctic Silver 2010 Evora S, with Martin taking the first turn in the driver’s seat. 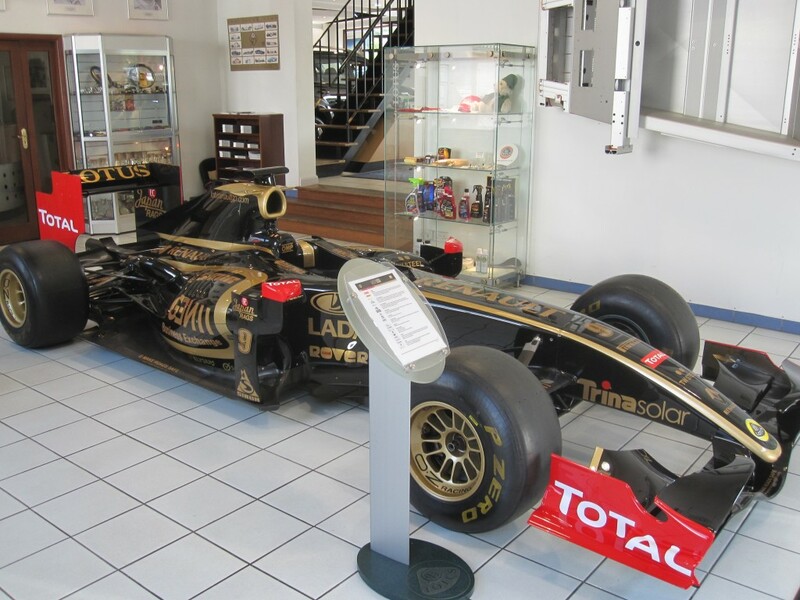 As we get in the first thing he does is place his palm over the centre of the steering wheel—”If you do that, most people wouldn’t think they’re sitting in a Lotus.”. He’s got a point too, while as with Elise and its derivatives you still feel as though you’re sat low within the chassis the sills are far easier to traverse and the interior architecture is unlike any Lotus I’ve been in before. While there has been much talk of build quality and how the Evora does or doesn’t stack up against its rivals from where I’m sat I can’t see any obvious issues. The demonstrator car is fitted with the Premium Pack so almost every surface is swathed in striking Paprika leather; the stitching is neat, fit appears good and there are no tell tale signs of wear and tear. Of course I’m not a regular entrant into the world of £60,000 sports cars, but I couldn’t find any faults to pick. This particular car is fitted with the larger Design style diamond-cut wheels, 19” at the front and 20” at the rear, but despite this the first thing that you notice from the passenger seat is that the ride quality is outstanding. There’s none of harshness you experience in many modern sports cars as you cross imperfections in the road, nor any of the bangs and clonks that rattle through the chassis of even the latest Elises as you hit potholes and expansion joints. As the road opens up Martin starts to show what the car can do and it’s seriously impressive, pitching the car into corners at speeds that are scarcely believable while still clearly having plenty in hand—it’s a stark lesson in the difference between people who race cars for a living and us mere mortals and it’s not an act I’m going to attempt to follow. So when we pull over and swap seats I’m thinking more about ergonomics than any kind of heroics. Get behind the wheel and it’s easy to make yourself comfortable. As the chassis rail curves in there’s a slight offset to the pedals, but not enough to cause any issues and whereas in the Elise taller drivers may struggle to get comfortable there’s plenty travel on the seat to accommodate those over 6ft, although passengers in the back will probably still prefer a slightly shorter driver to avoid the legroom dropping down to zero. 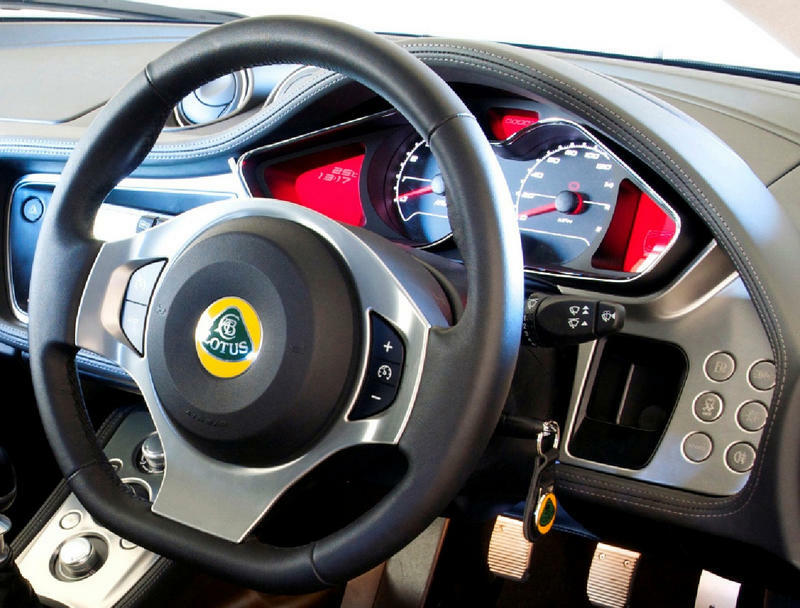 The dash is well laid out and clear, the dials positioned and shrouded in a style reminiscent of the traditional STACK display of the Elise, but flanked by a pair of red LCD panels providing all the pertinent information the driver needs. Personally I preferred the blue hue shown in the Evora GTE Road Concept, but it’s a minor quibble. Elsewhere on the dash some of the buttons are a little tricky to fathom as well, with a lack of contrast between the silver dash and the icons, but that’s something that an owner would quickly learn and fortunately I don’t need to concern myself with them now. For me the steering wheel is positioned perfectly, but as I pull away I find the positioning and throw of the gear lever means 1st is just a fraction further away than I would like. Pleasingly this and the dash colour issues are apparently being addressed in the MY12 updates, although in the case of the dash only on the Evora S, which gets a gunmetal finish to differentiate it from the standard model. 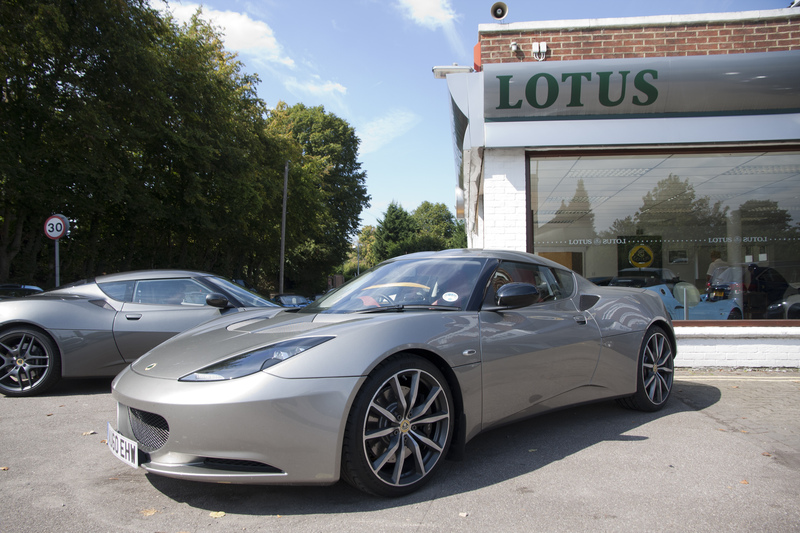 On the move and the steering, while power-assisted on the Evora, feels perfectly weighted and maintains the all important flow of feedback from tread block to driver we’ve come to expect from a Lotus. Criticism has been levelled at the Evoras gearshift as its only real dynamic flaw, and if I’m honest it’s not quite up to the high standards set elsewhere. It’s certainly not obstructive in its use, but nor is it satisfying or mechanical in the way some of the best gear shifters are…. What is satisfying however is that engine. It may not have the most soulful exhaust note (again, soon to be revised) but what it does have is ample power and strong mid-range urge thanks to its Roots type supercharger. Put your foot down for an overtake and changing down a gear is purely optional. It’s a very flexible engine and doesn’t dictate a particular style of driving in the same way that something like the Elise 111R’s peaky 2ZZ-GE unit can, and quickly piles on the speed. We take in a variety of roads, from fast and flow, a quick motorway blast and some tighter, more technical roads on the way back to the dealership and it handles them all with aplomb. 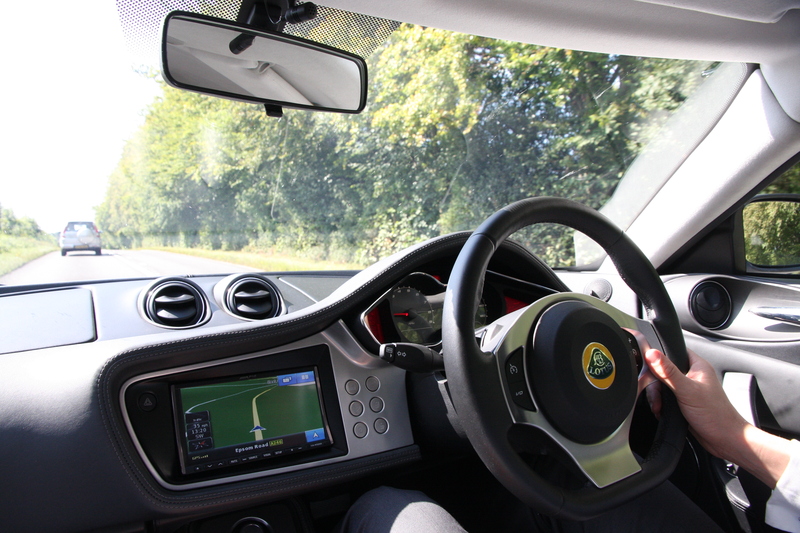 On the motorway it’s particularly impressive, settling in to a relaxed cruise in a way no Elise or Esprit I’ve been in can and does a fantastic job at suppressing wind and tyre noise—you’ll have no problems holding a conversation with passengers in here. While on the subject of Frankfurt we get to talking about the upcoming Evora S IPS, my distain for automatics and their importance in certain markets, and before I know it I’m being ushered into a second demonstrator—another Arctic Silver car, but this time a 2011 Evora IPS. As I take control of the car I have to admit it’s not like any automatic I’ve driven before. With Sport mode on there is a real keenness for the car to hold a lower gear, giving a good strong response to the throttle, to the extent that I’m not really missing the extra punch of the S’s supercharger in fact. The gearbox has just been reprogrammed with the latest software as well, meaning when you opt to use the paddles to change the gear it stays that way until you tell it to go back to automatic mode, rather than after a set amount of time has elapsed. Switching Sport mode off and the Evora IPS takes a more relaxed approach, revs are kept lower and the throttle response is backed off, perfect for long distance cruising or moving seamlessly through city traffic. Okay so I’m not convinced that I’d choose the IPS over the Close Ratio manual box, but it’s far better than I’d been led to expect, and that’s something that can be applied to the Evora as a whole—it’s a fantastic overall package and people need to try it and form their own opinions, rather than simply relying on internet folklore and hearsay.